The tenor of my work has shifted in recent weeks. Now that the overall structure of the boat is complete, I am moving on to small details that make the boat more functional and, I hope, more attractive. The work is fiddly, but with each new piece, the boat looks less like a plywood box and more like a proud member of the maritime tradition. ...I thought paneled doors would look nicer. Were they worth two weeks of work? It occurs to me that this is where builders start expressing their own personalities–and also start going their separate ways. Up to this point, we are all more or less following the plans—measuring offsets, cutting stringers and working through the same mathematical problems. One pocket cruiser looks more or less like any other. But once the hull and cabin are in place, we can do what we want. Some builders have a single-minded determination to get into the water. 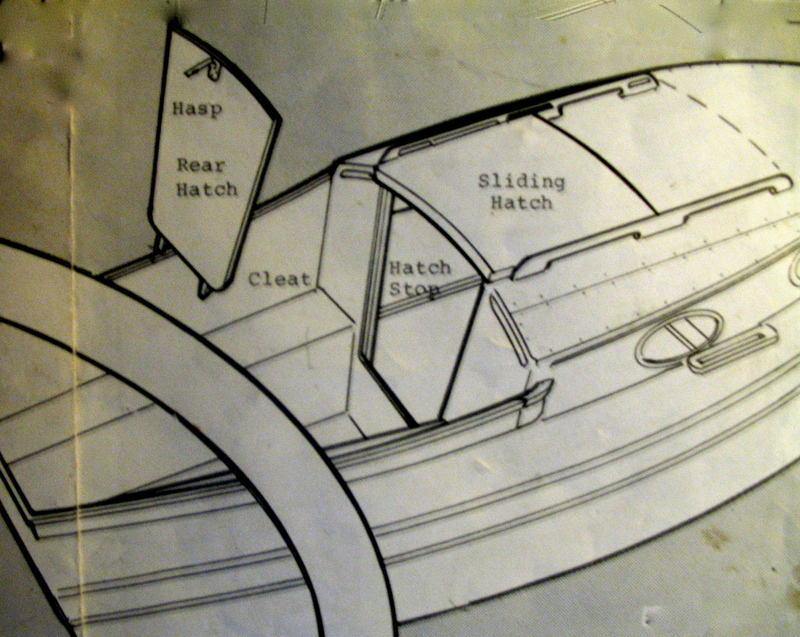 They don’t sweat the details and don’t worry about adding anything unnecessary to their boats. They can practically feel the spray in their faces and do only what is necessary to wrap up their work so that they can test their mettle in the open water. On the other extreme are those who seem to relish the opportunity to linger over the finishing touches. They want the hulls to shine and the brass to gleam. They look for new and novel places to install brightwork. They want to enter the water in style and are willing to wait weeks, months—maybe even years—for their day in the sun. So, where do I stand in this continuum? A year ago, I thought I was a member of the hurry-up crowd. I wanted to build with care, but not waste time. My mantra was, Stick to the plans! But now that I am near the finish line, I find myself repeatedly detoured by small changes and improvements that keep me in the garage and delay the boat’s christening. The most recent culprit is the hatchway door. In the plans, the Stevenson’s (who are unapologetically committed to fast and simple construction) direct builders to simply cut out a single panel from a quarter inch sheet of plywood. To secure the hatch, the panel is simply lifted in place. To gain access to the cabin, the panel is lifted away. From the beginning, however, I found this to be an inelegant and inefficient solution. Where, I wondered, would the six square foot panel be stored? Beyond this logistical problem, a large plywood panel is simply a cumbersome and unattractive addition to the boat. So I determined early on that I would, instead, build hinged doors. For the sake of simplicity, they, too, could be built out of plywood and that was, in fact, my original plan. But when it came time to construct my hatchway, I decided that I wanted to add a bit more style—nothing fancy, but something a little bit salty. So I decided to make paneled doors instead, and—just for fun—use some leftover cherry for the frame. I wasn’t looking for anything unnecessarily ornate—my tastes run toward Shaker and Craftsman styles—but a gently curving archway of sun-darkened cherry wood seemed just right. Varnished, it would look quite fetching against the otherwise painted hull. But this suddenly turned a minor step into a moderately complex piece of cabinetwork. I was in familiar territory since my previous experience in woodworking (such as it is) is in furniture making. But I also prefer hand tools, so much of the work was accomplished with hand planes and a homemade bow saw. It’s how I like to work, and I’m not complaining, but it takes time and after a week at my workbench, I started wondering if I had made the right decision. If I had simply followed the plans, the hatch could have been banged together with a jigsaw and screws in an hour or two. 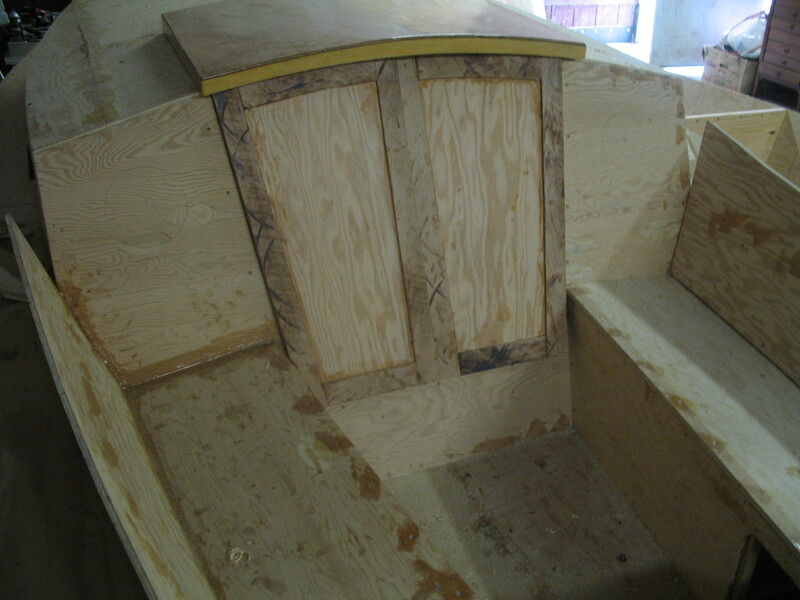 Perhaps I could have moved on to more consequential steps like fiberglassing the hull. Slowly, however, the doors came together and, while they are a bit rough and not yet sanded, I find them pleasing and I am glad that I took time to do something just slightly beyond what was necessary. Sailing is, in the end, an aesthetic experience, and it seems right and proper that our boats reflect our own tastes. If they didn’t, why bother building in the first place? This entry was posted on Saturday, May 29th, 2010 at 8:31 am and is filed under Building the Cabin and Seats. You can follow any responses to this entry through the RSS 2.0 feed. You can leave a response, or trackback from your own site. Bravo sir, I wish that someday my woodworking skills will be good enough to pull off something like this. Your post inspire me, keep the updates coming.